Q-scope digital microscopes are the perfect solution for microscopic inspection in a broad range of applications like industrial quality control, medical & life sciences, forensics, science & education, art restoration and many other fields. This model, QS.20200-P has a 2.0 Megapixel sensor with high grade optical glass lens providing superb image quality, especially for a microscope at this price level. Magnification is variable between 10x and 50x with an additional level of 200x. 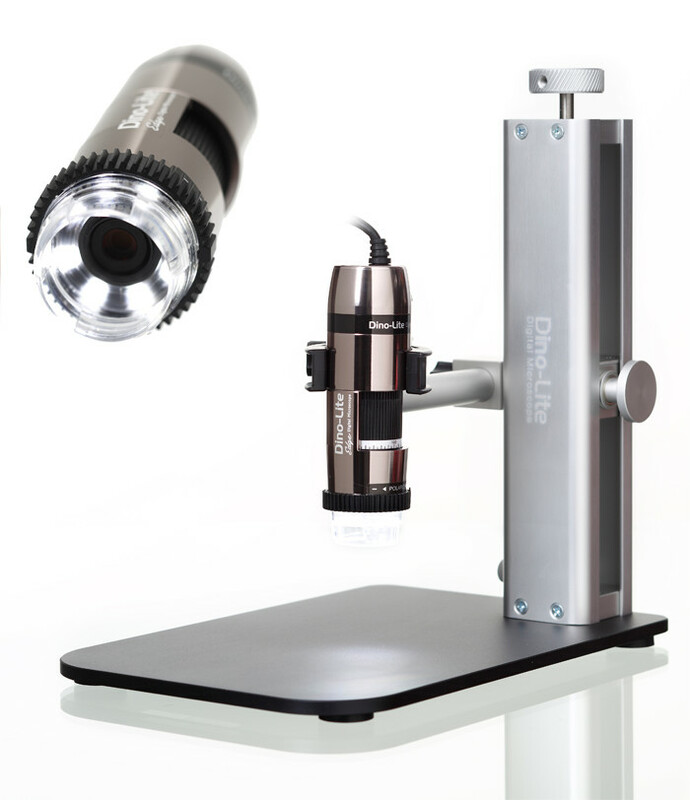 Built in LED illumination coupled with an adjustable polariser to reduce reflection on bright and shiny surfaces makes this Q-scope microscope a fantastic package. Get connected through USB to your Windows or Mac computer to observe and analyse captured or live images with powerful user-friendly Q-focus software. Different types of stands for hands-free usage are available, from basic to professional. View available stands on the Related Accessories Tab. This USB microscope includes Q-focus software for PC & Mac OS. The software is user friendly with intuitive buttons and extensive features allowing: live video, saving of images, videos and time lapse video, measurement with calibration including line, radius, 3-point circle and angles; annotation for adding notes on images and an image/video library. Available in English, Dutch, German, French, Spanish, Italian and Vietnamese language. Hand-held USB digital microscopes provide a powerful and portable solution to microscopic inspection for applications like industrial quality control, medical & life sciences, forensics, science & education, art restoration and many other fields both at work and for hobbies at home. At PeplerOptics we specialise in optical instruments for inspection and have carefully selected a range of digital microscopes to suit all budgets without compromising on image quality. We will gladly provide expert technical advice to help you select the best digital microscope for your application. We were extremely impressed when the Q-scope range of digital microscopes arrived here at PeplerOptics. Designed in Holland by Euromex, who are arguably one of the top microscope companies worldwide, the Q-scope range offers unrivalled price/performance with no compromise on image quality.